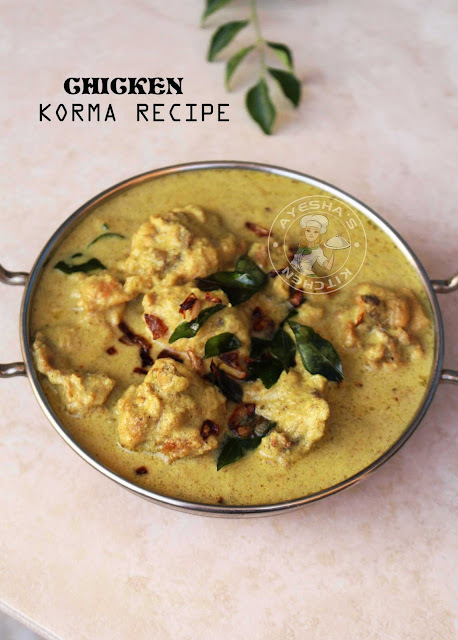 Today I am going to share you the recipe of Chicken Korma, which is a traditional South Indian dish. Since coconut is available abundantly in South India especially in Kerala, people always prefer this chicken dish than any other one. Children also like to have this as it is less spicy compared to the other Indian dishes. Kerala or Malabar style chicken korma is a very popular chicken dish which is served along with Malabar rice pathiri or Malabar ghee rice. 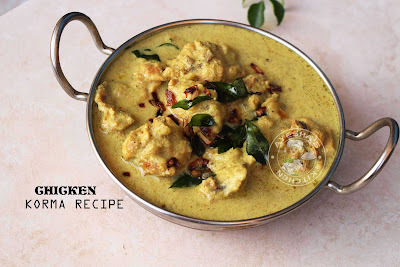 The flavor and texture of this curry are really impressive and is heavenly delicious. Heat a nonstick vessel with oil. Add the sliced onion and saute well. Once the onion turned to golden slightly, add the paste of ( green chilies, ginger, garlic) and salt. Mix well. Keep the flame to medium.Saute until the raw smell disappears. Now add the chopped tomato and cook for few minutes with lid closed. When the tomato is done, add the cleaned medium sized chicken pieces to it and mix well. Let it cook for few minutes and then add pepper powder, coriander powder, turmeric powder(optional), and garam masala powder. Add required salt too (no need of adding water). Cook for few minutes until the chicken is almost done and well coated in the gravy. Now you can add little water if the gravy is too dry. By the time grind the coconut and fennel seed(perum jeerakam) with little water, to a fine paste. Make a thick coconut paste. 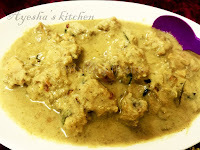 Now add the ground coconut mixture to the chicken gravy and cook in a medium flame for few minutes. (8 to 10 minutes approximately). Heat 2 tbsp of oil (coconut oil is more preferred) in a pan and fry the chopped small onions and curry leaves. When the shallots turn golden, pour it over the curry for seasoning the curry. Combine well and serve. Serve hot with Chapathi, Parotta, Ghee rice, Puri, etc.. Please SUBSCRIBE my cooking channel Ayeshas kitchen for cooking videos. Thank u.